The Student Who Once Nudged His Way To The Oval Office Now Hopes To Move In John Kasich, GOP presidential hopeful, has had a habit of speaking his mind, even as a college student at Ohio State. It has served the Ohio governor well in politics. 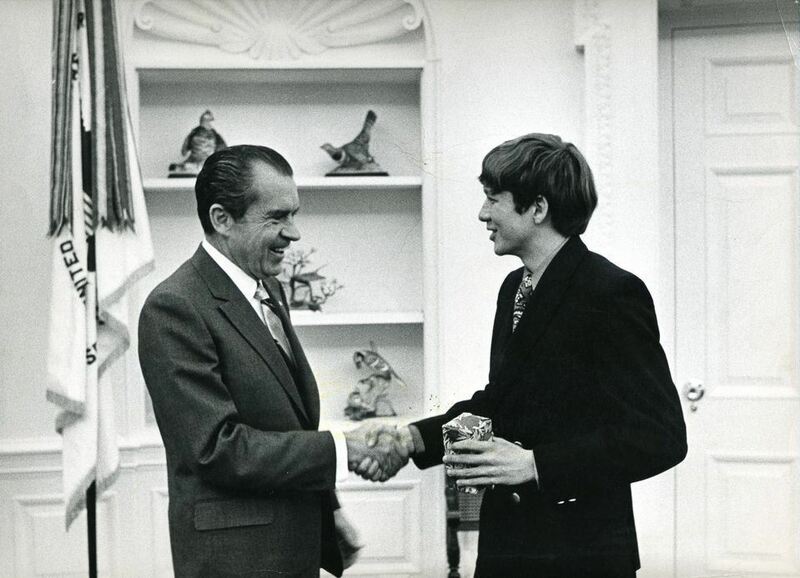 President Richard Nixon meets with John Kasich, a freshman at Ohio State, on Dec. 22, 1970. Few presidential candidates go around invoking Richard Nixon. But that's exactly what GOP hopeful John Kasich does. It all goes back to a complaint Kasich had about his dorm room and a meeting with a university president 45 years ago. Kasich is nothing if not persistent. He was a kid from the working class McKees Rocks, Pa., but he went to college at Ohio State University, and that's where he kicked off his presidential campaign this summer. OSU football legend and two-time Heisman trophy winner Archie Griffin warmed up the crowd at Kasich's campaign launch. He led a cheer that anyone who's attended a Buckeye football game knows — Griffin shouted "O-H" and the crowd replied with a loud "I-O." 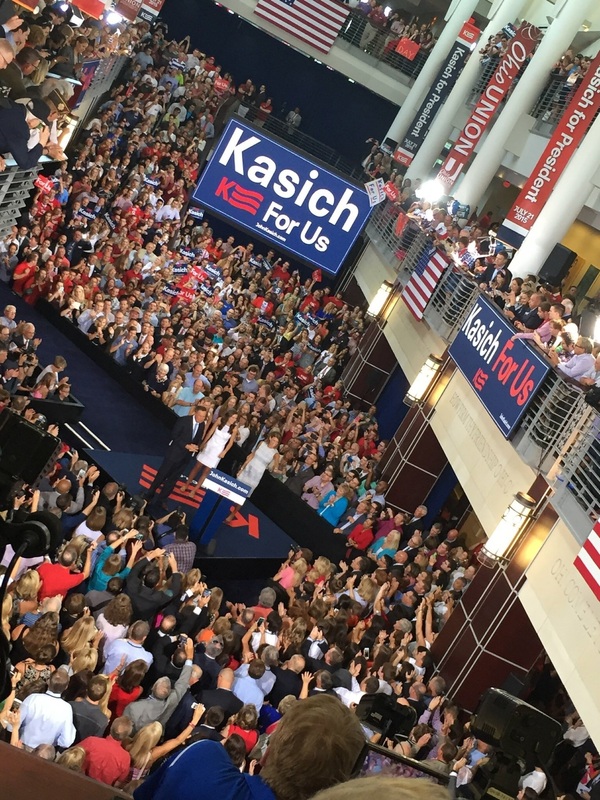 Moments later, Kasich was onstage at his alma mater and reminiscing about his old dormitory. "I came here to Ohio State," he said. "I found myself on the 19th floor of one of those towers. You could hit it with a stone from here. The place was 23 floors high. The tower next door the same size. Ohio State can be a pretty intimidating place." But Kasich the student was anything but intimidated. There's one tale from back then that's become a campaign staple for him. As a college freshman, he had some complaints about that high-rise dormitory, including a rule forbidding residents from opening the windows. He says he got nowhere with housing officials, "so I called the President's Office and started badgering them until they finally let me in." 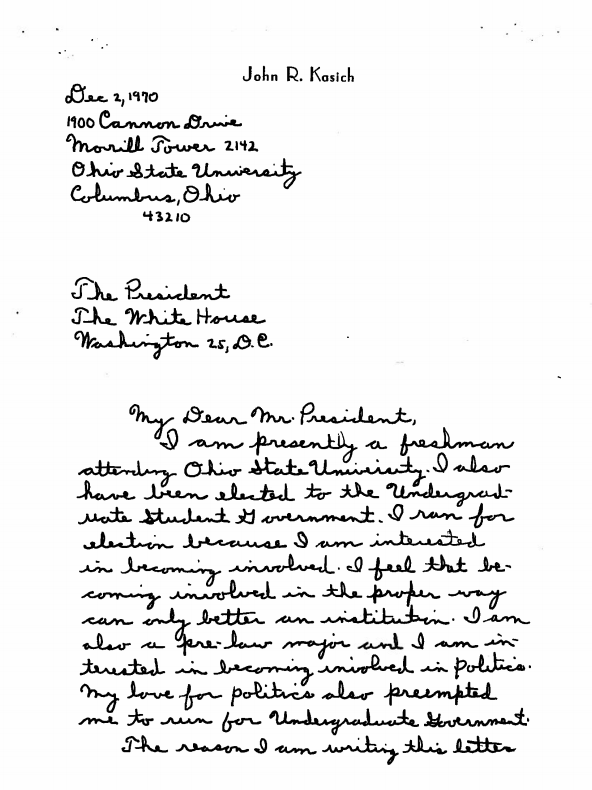 As a college student, Kasich wrote to Nixon calling him "not only a great president but an even greater person" and asking to visit the president in Washington. Nixon obliged. The university president in that fall of 1970 was Novice Fawcett. Kasich says he immediately took notice of the nice desk, the leather upholstered chairs, the beautiful rugs. And after raising his complaints, he asked what exactly a college president does. Fawcett noted his academic and fundraising responsibilities --then he mentioned something else. "He says, 'Tomorrow I'm going to go down and visit with President Nixon. And I said 'Well sir, there's a number of things that I would like to talk to him about also do you think I could go with you?' And he said 'No, you can't go.'" But Kasich — quick on his feet — asked if Fawcett would deliver a letter to Nixon for him. "And he said, 'Well, I guess I could do that.'" Kasich wrote the letter, praising Nixon as "not only a great president but an even greater person." He asked to come visit him in Washington. Days later, there was a letter in his dormitory mailbox — from President Nixon himself. Kasich immediately called his parents. Whatever your own political views are or your views of him personally you have to admire his ability to set a goal and make it happen. "My mother answers the phone and I said, 'Mom, I'm going to need an airline ticket, the president of the United States would like to have a meeting with me in the Oval Office,'" Kasich recounted. "And my mother is shouting 'Honey, pick up the phone there's something really wrong with Johnny.'" In the official White House photo of Kasich in the Oval Office he looks even younger than his 18 years as he shakes Nixon's hand. Both are smiling. It's dated Dec. 22, 1970. There's no telling exactly what they talked about because there aren't any notes detailing the conversation. And it was just two months before Nixon's infamous Oval Office taping system was installed. Back at Ohio State, Kasich's friends and acquaintances all heard the story --over and over. John Kasich announced his presidential bid in July at Ohio State University, where he went to college. "Yeah we all heard about it," said David Leland, who was a student at the time. "We viewed it as sort of weird, OK? Because Nixon wasn't exactly a figure that was admired on the campus of Ohio State at that particular time." It was the era of Vietnam war protests and the draft. But Kasich was a proud and vocal Republican. Leland, meanwhile, was and is a Democat. He's currently a state lawmaker in Ohio and a Hillary Clinton supporter. But he says he's glad Kasich is in the race on the GOP side. As for that moment from the highlight reel of Kasich's college days, Leland adds this: "You gotta admire the guy's guts and his ability to do what he wants to do. I mean whatever your own political views are or your views of him personally you have to admire his ability to set a goal and make it happen. And that's what he did in that particular case and that's pretty much what he's done throughout his life." Now, there is one other detail worth noting from that Oval Office moment 45 years ago this month. Kasich recalls that he was told he'd have exactly five minutes with Nixon. "I'll tell you what I'm thinking: I got new jacket, new shirt, new tie, new pants. I'm not coming out in five lousy minutes," he said. "They're out of luck." White House logs from that day show the meeting starting at 12:31 p.m. — and ending at 12:51 p.m. It's easy to see that same persistent, pushy kid in the now 63-year-old John Kasich. Except this time he's looking to actually move into the White House.